Manu's been missing home from quite a while now.. By home, I don't mean the place he can come to every evening from work, where he can play with Tanush and sit down with us as family for his dinner and end-of-the-day catchups.. He has been missing India.. He asks me every once in a while 'Chalen kya waapas (shall we go back)?' Well, his projects are based out of India for now, and that's why that it is not practical for me to answer that question..
My husband, Manu is from the beautiful state of Kerala from India.. (Yes, that means that we both are not from the same place originally). Kerala has these beautiful sceneries in a tropical setting, where Nature glows with joy whatever be the season.. It especially comes to a pleasant joyful lushness when it is monsoon there. A lot of people who hale from there, and have lived some portion of their lives there, can't really imagine living elsewhere.. I have a very close friend from my college, Jesline, who studied with me in Bangalore, but her heart was always in Kerala. Well, after visiting her place, I couldn't imagine why it could be otherwise.. Miles and miles of lush green plantations, a royal big house, a self sufficient life, perfect 100% literacy and all your near and dear friends and relatives around you! What more can you ask for?! 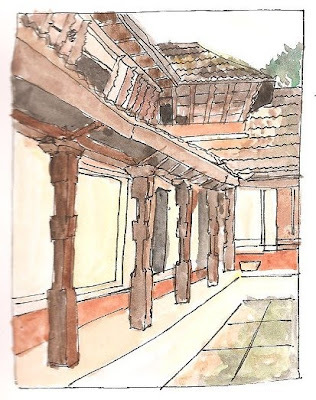 This is what a traditional Kerala house looks like.. Well a portion of it.. Manu's house doesn't really look like this - it is a little more modern, but many houses in Trissur still look like this..